Western Biogas Systems is a division of Bozco Engineering Inc. with over 20 years of experience in the energy industry. Project consulting, design and directing is offered. Rotating as well as separation industrial equipment selection, procurement, fabrication and integration is available for gases, air & liquids applications. Western Biogas Systems is focused on integrating the most advanced technologies in the treatment of Biogas for power generation & pipeline injection. Our capabilities to meet the most stringent gas specifications in the industry provide our clients opportunities to convert waste to energy as well as pipeline quality gas. Gas Analysis- The baseline analysis of input gas is evaluated in order to determine the most effective design for each system. Monthly/Periodic gas analysis in order to confirm project specs are met is also available. We provide detailed O&M manuals to ensure that any operator will quickly become comfortable with the operations and maintenance of our equipment. Consultants for the best selection of removal systems for each application. 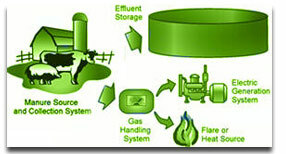 Effective biogas conditioning starts with evaluation of the best options available to accomplish a client’s unique goals. As not every goal is the same, so may be true regarding the incoming gas specifications. At Western Biogas Systems, we consult with each client, evaluating their best options for: dehydration, gas boosting, H2S removal, Siloxane removal as well as removal of other gas constituents. Western Biogas Systems provides all facets of a renewable energy project including: engineering and design, equipment fabrication, installation and ongoing maintenance support. Our biogas conditioning systems are custom engineered and fabricated based on site specific data. Gas boosting- Gas boosting selection of blowers and compressors and manufacturers performed to support the gas condition and power generating equipment needs. Scavenger & non hazardous chemical systems are selected and incorporated based on design criteria. Client O&M costs will be considered and minimized whenever possible in this process. Siloxanes are produced in digesters at wastewater treatment plants and landfills. Siloxane is a chemical used extensively in industrial products such as personal care products and lubricants. Damage to engines, turbines and fuel cells frequently occurs due to the presence of Siloxane, resulting in large maintenance or replacement costs for various facilities. Additional concerns occur with the resulting decrease in power generation. The most cost effective method of Siloxane removal incorporates simultaneous dehydration & Siloxane removal in one step.